This couple had just purchased their new home and wanted to have the kitchen remodeled. Nothing was physically wrong with it; It just wasn’t their style. 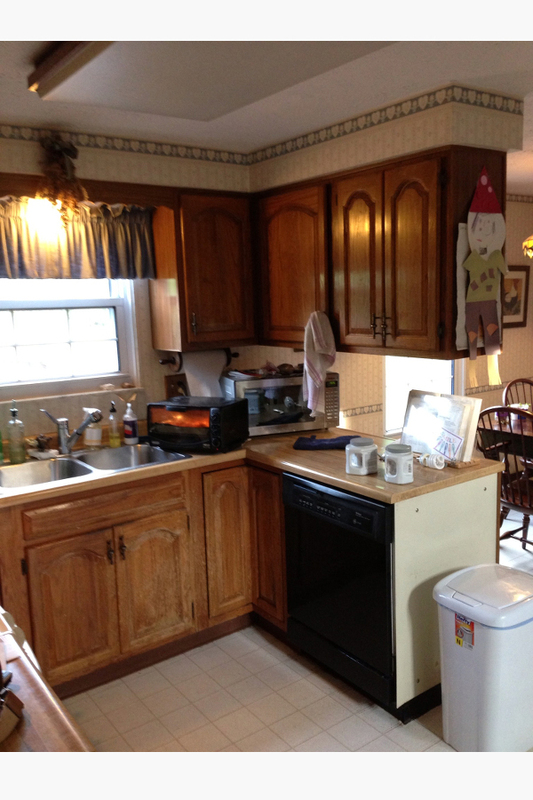 The biggest changes were to the cabinets and the countertops. 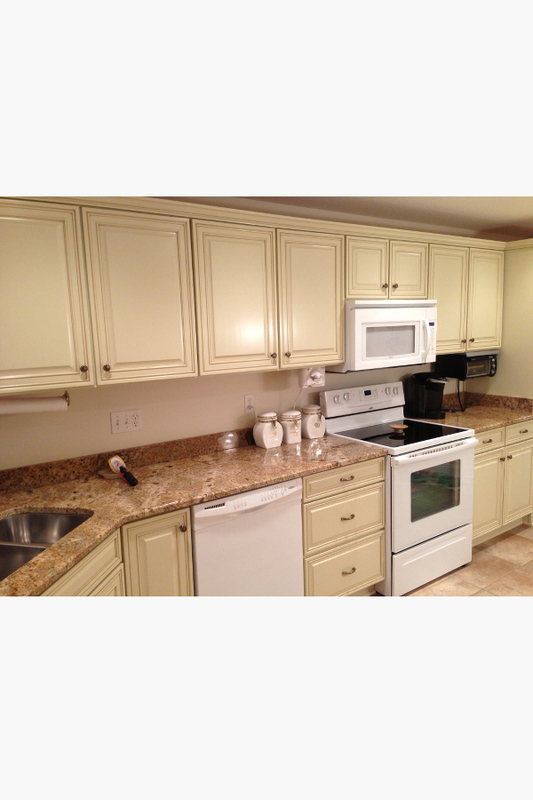 We painted the existing oak cabinets with an antique white finish. 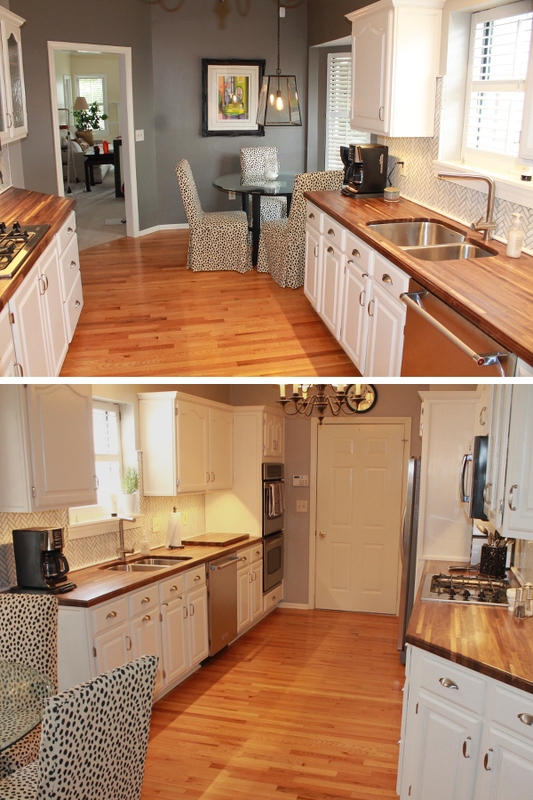 Then we replaced the tiled countertops with dark walnut butcher block. It was all in the details with this kitchen. The undercount sink and new faucet show off the edge of the butcher block. We built a matching cutting board to protect the countertops. We took out the mullions in the cabinet doors and replaced the panels with rain glass. We put a custom edge on the countertops. We found chandelier lampshades that echoed the lines of the light fixture over the table. And we pulled the remaining details together in a hand sewn window seat cushion and throw pillows. This client’s kitchen interior design needed a revamp. 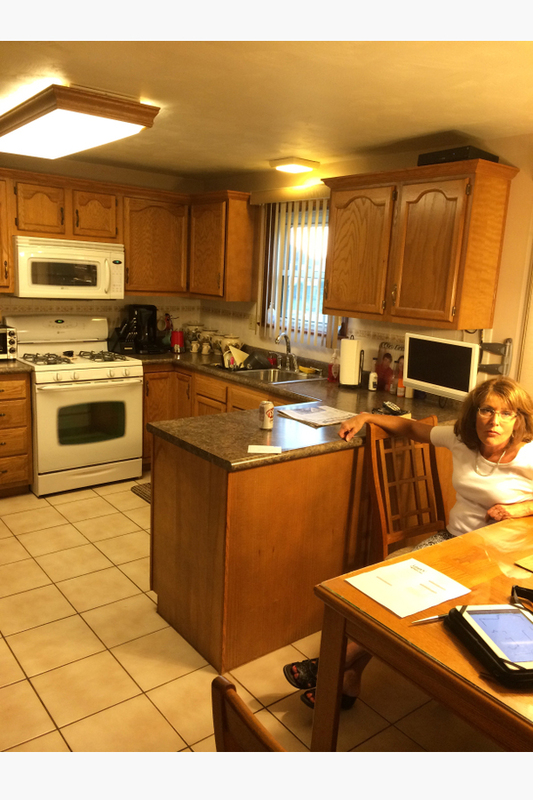 They wanted new cabinets, new floor, new counters, new appliances. The cabinets were oak. Since we weren’t changing the interior kitchen design floor plan, I convinced them to let me refinish the cabinets. They would have paid more money and gotten lesser quality for the same layout. In addition to refinishing the cabinets, I replaced the tile floor with hardwood in the kitchen, hallway and dining room. We also installed quartz countertops, a glass, stone and brushed steel backsplash and recessed lighting. We also replaced the semi-flush and chandelier lighting. I also convinced them to save their current oak table and chairs by letting me refinish and reupholster them. They were good quality; they didn’t need to be replaced. This client wasn’t a complete overhaul of their kitchen interior design. There was some plaster repair and painting of the walls. The main tasks were replacing the floor and countertops. The hardwood floor had been refinished as many times as possible. We needed a low profile solution. We couldn’t just install a standard wood floor overtop of the existing. I installed a glue-down cork flooring. It’s resilient, more comfortable than ceramic tile and can be treated and resealed just like hardwood. 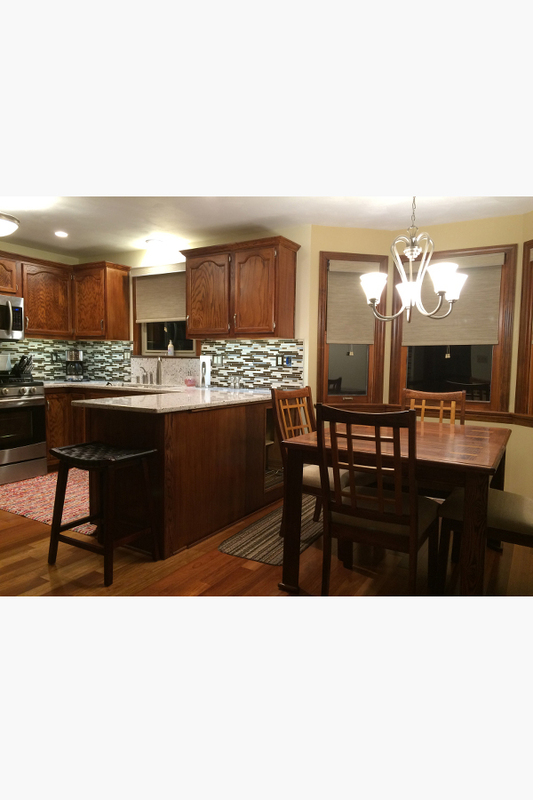 We replaced the countertops and tiled the backsplash with glass tile. The backsplash tile was a glass silk screen. It really popped with the white quartz countertops. 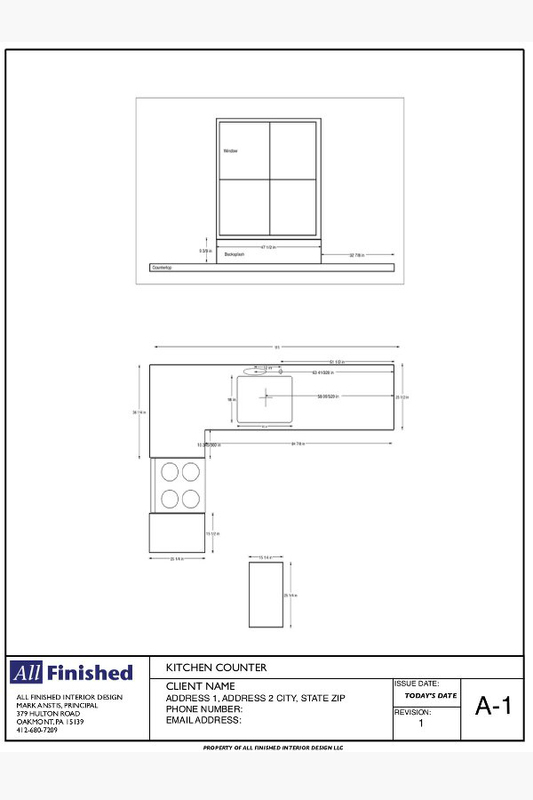 This client wanted a new look but the budget didn’t allow us to change the interior kitchen design. We had to keep the existing floor plan, cabinets and countertops. We replaced the vinyl floor with tongue and groove wood, replaced all of the lighting fixtures, refinished all of the cabinets with antique white paint and hand wax, removed the wallpaper and painted, replaced the sink and faucet and created custom window treatments. 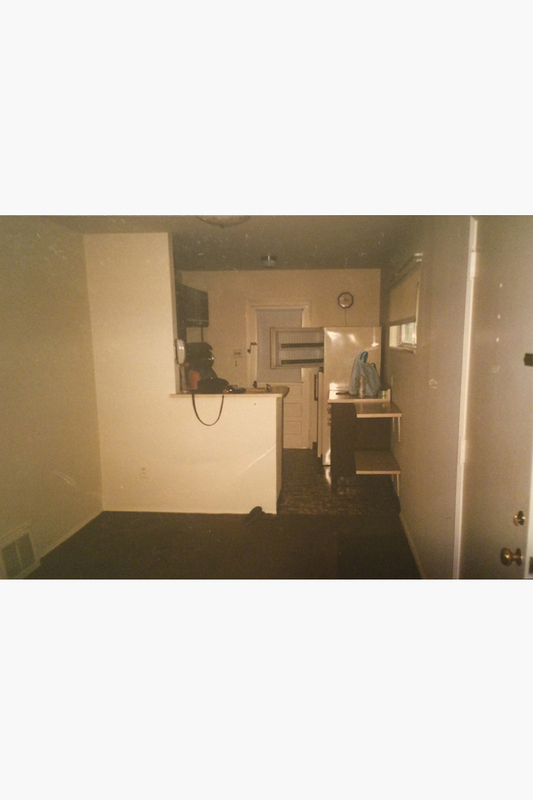 The biggest change in appearance was the floor, walls and the cabinets. I removed the existing sheet vinyl and wood parquet and replaced them with tongue and groove wood. I was able to refinish most of the cabinets with a distressed off white paint and wax. Those that were structurally unsound I replaced and finished. I also removed all of the wallpaper and painted the walls. I made the window treatments and chandelier lampshades to pull everything together. We made use of the back of the cabinets by creating cork and chalk boards. We added detailed molding to give the cabinets a custom look. 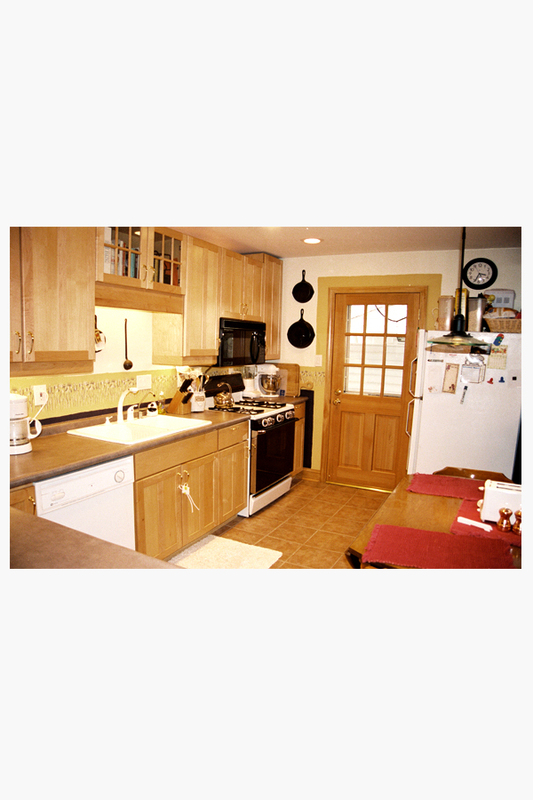 This kitchen was completed by the builder when the client bought the home. But, it needed a finishing touch that personalized it to the client. It was just a sea of off-white. I installed a brushed steel backsplash and a custom hand finish on the walls that was two coats of three colors of plaster finished with a wet sanding and then a hand rubbed tinted wax. This kitchen interior design could have won the world’s smallest kitchen award. Two people couldn’t cook in it. And there was no storage–just one cabinet below the sink and one above. We removed the half wall and added the space used for the little eating area, to the kitchen. Then we tiled the floor, added cabinets-galore, updated the door added recessed lighting and replaced the barely noticeable window with a bay window.